Greatly reduces drying time with fewer wring-outs. Absorbs up to two times the water of traditional terry towels. Leaves a spot-free finish without streaking. Large 22" x 30" waffle texture microfiber towel. 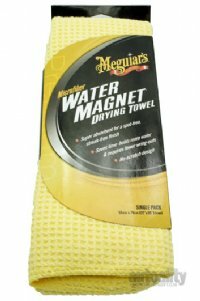 Meguiar's Water Magnet Microfiber Drying Towel reduces drying time with less wring-outs by absorbing up to two times the water of traditional terry towels. This ultra-plush and extra-large 22" x 30" waffle textured towel wrings out easily leaving a spot-free finish.